"Today is November 2. Do you recall 1984? Lakhs of Sikhs were massacred in Delhi and across India on the second, third and fourth day of Indira Gandhi's killing in which serious allegations were made against Congress and its leaders. Today, on the same day, Congress party is giving lecture on the issue of tolerance. 'Doob maro, doob maro'. This does not behove you. "The tears in the eyes of the Sikh victims have not yet dried. Their wounds have not healed and you are doing this 'dramebaazi' on November 2," the Prime Minister said addressing an election rally in Seemanchal region of Purnea where the last phase of Bihar polls are due on November 5. The remarks of Modi came as the Congress top leadership decided to meet President Pranab Mukherjee to raise the issue of "intolerance". It also came a day after Congress President Sonia Gandhi voiced concern on the issue at a function in the national capital and vowed to fight the "diabolical design" of divisive forces to spread hatred, which posed a threat to the unity of the country. Taking a dig, Modi "thanked" Bihar Chief Minister Nitish Kumar and RJD chief Lalu Prasad for giving 40 seats to Congress saying these seats will easily come in BJP's kitty. "Both Lalu ji and Nitish Ji have been fighting against Congress for long. There may be some compulsion of both of them that they have given forty seats to Congress, a party which is non-existent in Bihar. "I am thanking both of them for one thing that both gave us 40 seats without a challenge. We have thus got the 40 seats on a platter. I thank Lalu ji and Nitish ji for these 40 seats given to Congress. 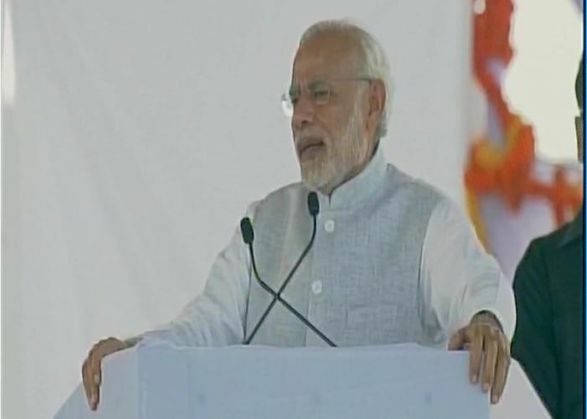 For the rest, I am thanking people of Bihar," Modi said. The Prime Minister also held that Nitish Kumar's rise in the state politics was due to "blessings" of the then Prime Minister Atal Bihari Vajpayee and people voted for him as they were desperate to get rid of 'jungle raj'. "People had faith in the capability of Vajpayee ji. Hence they supported you. Now you no longer have Atalji's blessings. People will not trust you," he said, claiming that Mahagathbandhan leaders are "scared" of his visits to Bihar.